← Teresa J. Hagy, M.Ed. 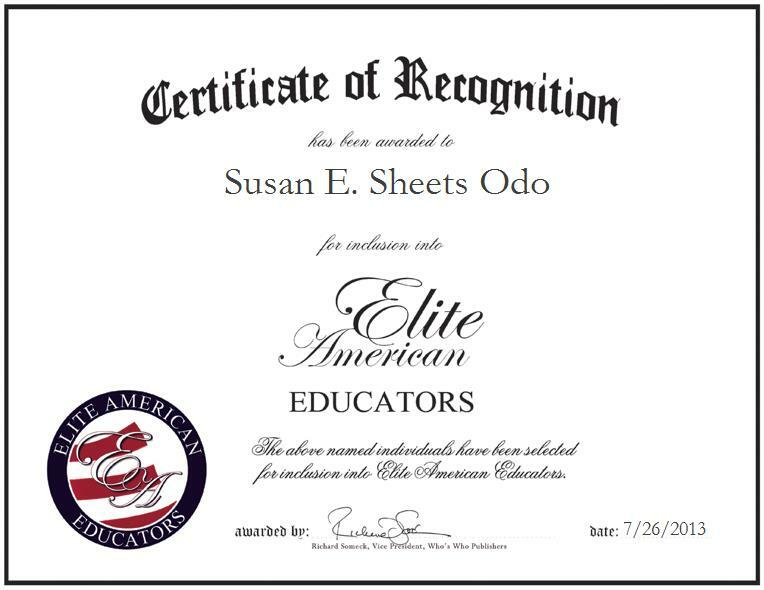 WYOMING, MI, July 26, 2013, Susan E. Sheets Odo, Director of Educational Services Wyoming, has been recognized by Elite American Educators for dedication, achievements, and leadership in early childhood services. In taking on an executive leadership role at a progressive and forward thinking educational institute which offers global learning and partnership opportunities, Ms. Odo is primarily tasked with creating and promoting new curriculum, training teachers and recruiting students. She makes the most of her years of experience, expertise in early childhood and pre-kindergarten education, and love of helping young children to learn and grow by lending a hand to the kids who need suitable care and a quality education. As a small-business owner, a philanthropist, and an advocate for adoption and a teacher focused on global learning and global partnerships, Ms. Odo shines as a luminary in her field, and also, in her community. She was named Most Outstanding Woman of the Year in 2002, and she was also granted with the Angels of Adoption Award by the Congressional Coalition on Adoption Institute in 2010. Upon reflecting on a rewarding career, Ms. Odo attributes her success to sheer determination, and to her welcoming, sociable, friendly and gracious personality. She is currently in pursuit of a Doctorate Degree.